Polygamy of Valentinian I – Early Mormons? Who knows what the truth of it was? Although Gibbon deprecates the story (as a fable) he tells it anyway (what does that mean?). Sometimes Gibbon comes across less like an 18th century proto-socio-anthropological historian, and more like a prissy, prudish, upper-class gossip relating slightly off-color stories in a stuffy London parlor, artfully balancing tea on one knee and cucumber sandwich on the other. Supposedly, (per the historian Socrates of Constantinople) Valentinian became enamored of the daughter of a Roman governor (Justina) who was a friend of Severa (current wife of Valentinian and mother of the next emperor Gratian). Hearing of her beauty (from persons seeing her at the baths), he took her as a 2nd wife. Gibbon maintains that he did it AFTER divorcing Severa. Socrates says not. 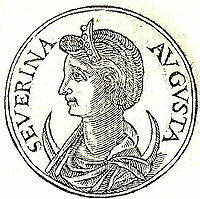 Marina Severa married Valentinian before he ascended to the throne. Their son, Gratian was born in 359 at Sirmium in Pannonia. Valentinian was chosen emperor in 364. He divorced his wife around 370 to marry Justina, widow of usurper Magnentius. This account was dismissed by later historians whose interpretation of it was an unlikely legalization of bigamy. However Timothy Barnes and others consider this decision to only allow various Romans to divorce and then remarry. The controversy being that Christianity had yet to accept the concept of a divorce. Barnes considers that Valentinian was willing to go forth with the legal reformation in pursuit of dynastic legitimacy that would secure his presence on the throne. John Malalas, the Chronicon Paschale and John of Nikiû report Severa to have been banished because of involvement in an illegal transaction. Barnes considers this story to be an attempt to justify the divorce of Valentinian I without blaming the emperor. When Valentinian died in 375, he was buried in the Church of the Holy Apostles in Constantinople, next to his first wife. 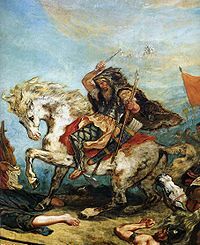 Painting detail from Atilla and his Hordes Overrun Italy and the Arts by Eugene Delacroix (a near-contemporary of Gibbon and his Decline and Fall). A very romantic and heroic portrayal of a Hun. Unlike Gibbon, not everyone thought pastoral Steppes-Peoples were little better than animals. The earthquake created a tsunami in the Eastern Mediterranean that was remembered for centuries. In Alexandria alone, 50,000 people died in one day when the waters poured over that low-lying delta city as much as 2 miles inland. For 300 years (up through the Muslim invasions of Egypt), the Alexandrians marked July 21 as the “Day of Horror” in commemoration of the deaths and destruction due to the quake and floods. Slightly after daybreak, and heralded by a thick succession of fiercely shaken thunderbolts, the solidity of the whole earth was made to shake and shudder, and the sea was driven away, its waves were rolled back, and it disappeared, so that the abyss of the depths was uncovered and many-shaped varieties of sea-creatures were seen stuck in the slime; the great wastes of those valleys and mountains, which the very creation had dismissed beneath the vast whirlpools, at that moment, as it was given to be believed, looked up at the sun’s rays. Many ships, then, were stranded as if on dry land, and people wandered at will about the paltry remains of the waters to collect fish and the like in their hands; then the roaring sea as if insulted by its repulse rises back in turn, and through the teeming shoals dashed itself violently on islands and extensive tracts of the mainland, and flattened innumerable buildings in towns or wherever they were found. Thus in the raging conflict of the elements, the face of the earth was changed to reveal wondrous sights. Such is the bad taste of Ammianus (xxvi. 10) that it is not easy to distinguish his facts from his metaphors. Yet he positively affirms that he saw the rotten carcase of a ship, ad secundum lapidem, at Methone, or Modon, in Peloponnesus. Crete, and the sea around Crete has been the epicenter of disaster before the Earthquake of 365. 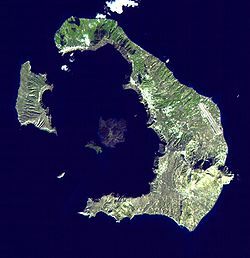 The most famous example is the destruction of the island of Thera (Santorini). This peaceful Aegean isle – settled and citied by Minoan Crete but also home to a volcano, experienced a world-shaking volcanic explosion in the early 1400’s BCE – ripping the top of the entire island and destroying an entire civilization (see Minoan Eruption here). Granted, Minoan Crete is a far cry from Valentinian I and the 360’s CE, but the murals are gorgeous, and for some reason Crete seems to lend itself to Mediterranean-World-Changing events. An excellent archaeological site with incredible Minoan Cretan wall paintings is here at the Thera Foundation – an organization dedicated to resurrecting the Bronze Age city that stood on Thera (Santorini) before the incredibly disastrous volcanic explosion that destroyed the island, ended Cretan dominance of the Mediterranean, and allowed Asia and the Greek isles and mainland to be overrun by what was to become Classical Greek civilization. This is an almost ecological example of how an empty niche in the political “foodchain” (the destruction of Minoan Crete), leads to unexpected growth by a competing political culture (the Greeks). Without the volcano, would we have had Plato? 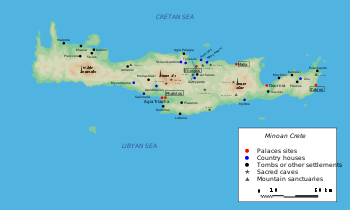 An overview in Wiki of the rise and fall of Minoan Crete here.